+ Lambswool is ideal for toe dancers' pointe shoes. + Footcare lamb's wool provides soft pressure protection for toes. + Fine washable medical grade lambswool cushions corns and abrasions. + Relieves pain and discomfort between toes. + Protects soft foot corns and tender areas between toes. 1. 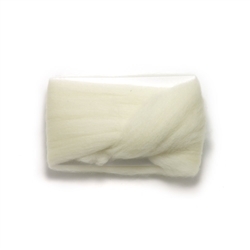 Pull off a small strand of lamb's wool, approximately 5" x 1". 2. Weave the lambswool strand between toes. 3. Or lightly wrap a single toe. One of the benefits of Lamb’s Wool is its versatility. - One can wrap just one crooked hammertoe to prevent corn formation and shoe irritation. Just pull a small strand of lambswool and gently rotate one or two times around the digit. - For maceration and fungal skin infections between toes pull a larger strand of lambswool and weave in between all 5 toes to allow air flow. Lambs wool will allow air to circulate in between the toes to dry out over wet skin (maceration). - If the tips of crooked hammertoes are painful and need to be cushioned then two small pieces of lambswool would be needed. One small strand is placed over the toe tip and the second is then wrapped around the toe to secure the first. - For ballet pointe shoes, a larger piece is wrapped over the first through the fifth toes, covering the tips. Then another large piece is wrapped over the metatarsals to lock in the toe part. - Another way to cushion ballet pointe shoes is to take a large strand and place it into the toe box of the pointe shoe. Then wear the shoe for several minutes. The lambswool will mold to the shape of the dancer’s foot. - Lamb’s wool is a natural material that will mold to the shape of your foot and allow air flow. This is not something that a foam, felt or silicone pad can do. More people should try lambs wool for their foot care needs.